Wouldn’t it be nice to get paid to do what you’re passionate about? Well, University of East London graduate Brian Gillespie does just that. 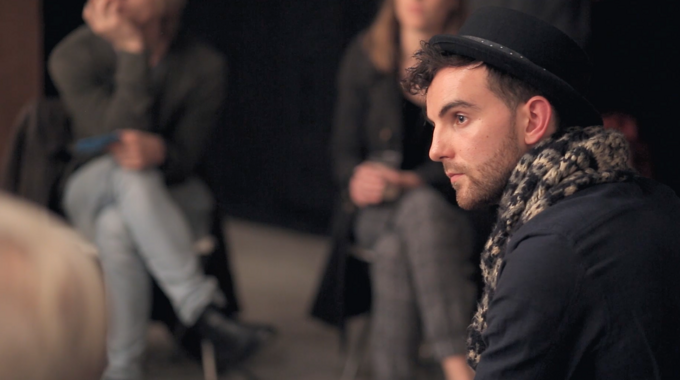 The 24-year-old Irishman graduated in 2012, achieving First Class Honours after completing a combined degree of Dance: Urban Practice and Theatre Studies. Today he runs his own dance company, B-Hybrid Dance, working as the artistic director and choreographer. He says he couldn’t see himself doing anything else. Brian came to London in 2009 with an interest in hip-hop and street dance. He decided to enrol at UEL after a great experience at an open day. He described the Dance: Urban Practice course as an “open catalogue”, adding: “It gives you tastes and flavours of everything. You’ll have different techniques every semester with different teachers who are all either top professionals in their field of dance or practitioners in some way or visiting lecturers. You have all of this external input all of the time. For his final university project Brian choreographed a duet with two friends which they performed at Stratford Circus. The success of this performance led to further opportunities, including being awarded a 20-minute slot at Resolution, a dance festival held at The Place, one of the top dance theatres in the UK. He has performed on the main stage of Sadler’s Wells, one of the biggest dance theatres in Europe, and at the London Olympics. Despite not having a background in business he soon found himself running his own dance company, a prospect he initially found very daunting. However, he and his dancers, many of whom he met at UEL, are going from strength to strength and he couldn’t be more proud of what they have achieved. “We’ve done performances for Cloud Dance Festival, for The Place, for Resolution three times. We’ve been commissioned by East London Dance, Pavilion Dance South West and we’ve done music videos for artists in the UK and America,” Brian recalled. After spending 2015 focusing on how he can improve the company repertoire, Brian has big plans for 2016. “The aim now is to have a national tour and to go around the UK and Ireland and then branch into Europe and America and from there just build,” he revealed. As far as advice for people aspiring to have a career in dance and theatre, Brian said: “Be passionate, be determined, but be ready for winds to change with time.